We are delighted to announce that Year 13 IBCP student, Kyle Princess Marzan, has won the award for South of England Career Ready Student of the Year! In a region of over 600 Career Ready students, this is an impressive achievement, putting Kyle among the top four students in the country. Kyle was presented with the award at a ceremony at Drapers' Hall on 2nd April, joined by Mr Herbertson, David Walker of the Academy's Career Ready Local Advisory Board, and Su Pickerell and Samena Choudhury from Wates. Career Ready has been incredibly impressed by Kyle's attitude to the programme; her initiative and drive has seen her grasp opportunities which has helped her discover the career she would like to pursue, and given her the skills, knowledge and confidence to pursue it. As an advocate for Career Ready, Kyle has appeared on the organisation's social media and website. 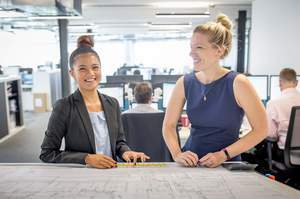 She has also been interviewed by the Financial Times about her placement with Wates Construction. You can read more about her experience here. We are extremely proud of Kyle and look forward to seeing where this success takes her in the future.